Time-independent growth of a dendrite with a nonisothermic surface is considered. 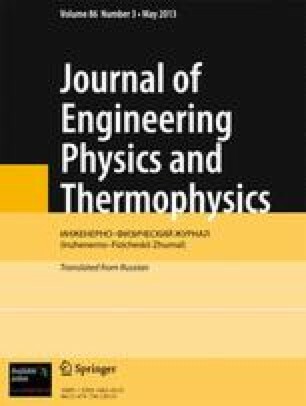 The Gibbs-Thomson correction, kinetic supercooling and the curvature correction under conditions of thermal balance are taken into account. The solid- and liquid-phase heat capacities need not be equal. We obtain lower estimates for the degree of difference of the dendrite shape from paraboloidal (parabolic), valid for any — not necessarily small — values of the parameters (supercooling, surface tension, etc.). Translated from Inzhenerno-fizicheskii Zhurnal, Vol. 61, No. 5, pp. 808–815, November, 1991.